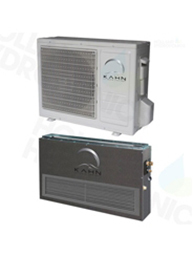 Climate Control and Air Conditioning Units by Kahn and Opticlimate to give the ultimate environment control for lights on and lights off temperatures for indoor sealed and non sealed grow rooms. The Opticlimate water cooled air conditioner unit is a complete solution for ultimate indoor climate control while using as little energy as possible. The OptiClimate 10000 Pro 3 Split comes with the very same high performance of the OptiClimate Pro 3 for closed loop grow rooms, but rather than using water for cooling, the Split version uses an outdoor air conditioning unit. OptiClimate accessories to help keep your system running smoothly and at it's optimum level. Including isolation springs to help prevent shaking from vibrations, a noise dampening plate to keep noise at a minimum and an air distribution tube. The Plenumbox allows you to simply attach ducting to air inlet on your OptiClimate.